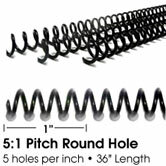 5:1 is a tighter pitch of plastic coil binding that gives a clean appearance on smaller books. Please check your punch to see if this pitch is right for you. The 36 inch length can be used for binding calendars or other large documents. It can also be cut down to fit multiple smaller books. We stock the sizes listed in this table, so call us now for the size and color you need. If all of your documents are Letter or A4 size, you may find that 5:1 coil in 12 inch lengths is easier to use.